Scoring a deal on a cruise can be a big win for your wallet and your mindset—food and lodging are typically included in cruise fares, making the vacation feel free once you step on board. But there are easy ways to sabotage your trip (and your budget) if you're not careful. Read on for five mistakes budget travelers tend make on cruises. A favorite budget travel strategy on tropical cruises is to hire a cab driver and take a tour of the island. It's a great idea. But it has some drawbacks and it can lead to disappointment. Some cab drivers make income on the side by delivering customers to area merchants. In return for bringing these folks, the driver receives a commission on whatever is purchased. If you appear to be an interested shopper, you could spend much of your limited time bouncing from merchant to merchant. Drivers tend to continue with this behavior so long as you're buying, and until you say "enough!" Don't even let that process begin. Tell your driver you want to see the top sites on the island and you are not interested in shopping. This is the time to decide if your driver can be a trusted partner or if a scam artist is behind the wheel. Shopping saps a great deal of time from your visit to any location. Shop in moderation, and leave plenty of time for seeing the sights. Once that's settled, express a time that you'd like to return to the pier. That time should be well in advance of when you are supposed to be back on the ship. Finally, agree on a price in writing. Explain, for example, that you'll pay $100 USD for a four-hour tour of the island, and that other expenses are either the driver's responsibility or need to be made known now. Some places have toll roads or admission fees. Who will pay those? Some budget travelers who sign up for cruises are celebrating an anniversary, birthday, or other life milestone. It's natural to want the best of weather, entertainment, and food. But a budget cruise is not designed to offer gourmet cuisine at every turn. It's priced to allow as many people as possible to experience the sea air and the terrific ports-of-call. That means food will be tasty and even plentiful, but not necessarily extraordinary. On ships such as the Carnival Dream, you'll pay a $35 surcharge to upgrade your dining from the standard fare (included in your cruise cost) to a white-linen tablecloth, ribeye steak experience. Once out of the realm of budget cruising, the meals included in your rate will improve. Just remember the cruise lines at a budget level are interested in delivering the entire experience at an affordable rate. Chances are good you'll remember the jungle hike or snorkeling trip much longer than what was served at dinner. Decades ago, I remember shopping in the market of Cozumel. There were onyx chess sets for sale, and even though I do not play chess, I thought the onyx board and pieces would make an attractive souvenir from the trip. I expressed moderate interest and bargained with the merchants for a while. Although I never made a purchase, it was a fun experience. These days, such shopping in Cozumel and other ports can be difficult to find. Developers have created markets not unlike what you'd find in your local shopping mall at home. Prices are fixed and expensive. Local specialties are displayed in ways similar to a duty free shopping zone at an international airport. Caution about spending too much time shopping already has been expressed. But when you do allow some time for browsing, be careful not to get caught up in impulse buying in these shopping complexes. There are some deals to be had, but much of the merchandise is overpriced. So, where are the native craftsmen who sell authentic goods at decent prices? Ask for some advice once you clear the artificial shopping zones. Cruise lines are building mega-ships these days. The largest now accommodate more than 5,000 passengers. Add in the needed crew members for serving that many travelers, and you'll find some of these ships pull out of port with about 9,000 aboard. These are not floating fortresses of solitude. Cabins tend to be small and tightly spaced. Lines form for everything from dinner to on-board fashion shows. On the Royal Caribbean's Harmony, the culinary team alone numbers in excess of 1,000. The ship kitchens and bars churn out 110,000 lbs. of ice cubes each day during a voyage. Imagine how busy the ports-of-call become when several of these mega-ships come calling at the same time. If you enjoy searching for privacy and quiet on a budget cruise trip, take careful steps to plan your shore excursions. 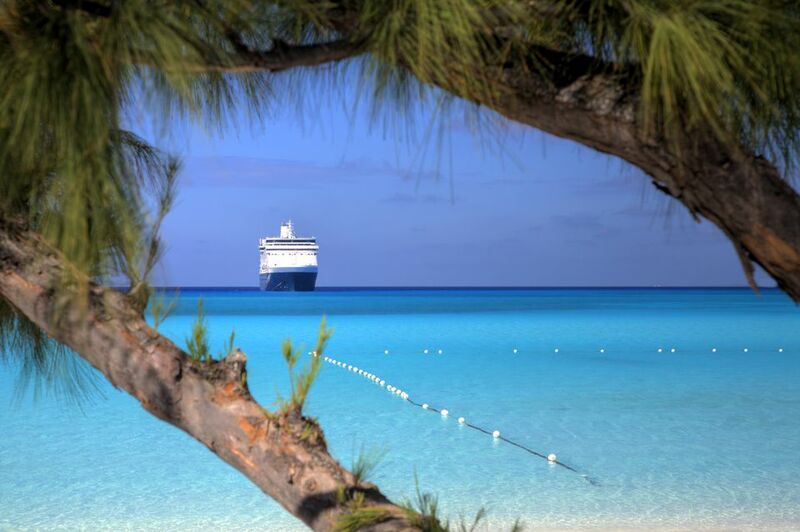 This is the way of the cruise world. Ships are getting bigger each year. One evening, I grew tired of the shipboard entertainment and decided to take a walk on deck. Shortly after that decision, I captured the picture you see here. Most budget travelers have moments like the one just described. Be alert for such opportunities. Savor the views and the people you meet. Many times, the memories you'll cherish most won't involve an entry fee.